When my first pregnancy ended in miscarriage and then turned out to be a molar pregnancy and resulted in cancer, I didn’t trust my body to do anything it was supposed to do. I became afraid of and paranoid about my health, and you’ve all seen that craziness unfold in my blog on occasion. In the year following the incident, I forced myself to do new things – things that scared me, like watercolor classes, acting workshops and yoga retreats – as way of regaining the trust I had lost in myself. The aha moment came when I finally figured out it wasn’t my fault. As you can probably imagine, I was kind of a Crazy Mama when I gave birth to Dylan two years later. My father-in-law joked that there weren’t enough specialists in the hospital or the state of Florida to help me. He was right! In my defense, I had a tough pregnancy that ended with preeclampsia and an emergency c-section at 37 weeks. I also had a blood issue that put me at risk for a clot and meant I had to have daily injections (administered by me!) for six weeks postpartum. Besides that, instead of milk coming from my breasts, there was blood. At the end of my second day in the hospital, a social worker came to my room to evaluate me because the nurses didn’t think my emotions were appropriate. They weren’t, and that’s when I had my aha moment. I had good reason to be a little (okay, a lot) nutty, but the real reason I was acting so crazy was because I was terrified. I had no idea what I was doing or how to take care of a baby, but I knew one thing: no one in that hospital was going to tell me how to be a mother so I had to take Dylan home and figure it out on my own. And that’s exactly what I did. It’s not that I wasn’t afraid a lot of the time, but I listened intently to Dylan and to the voice inside of me, and eventually my maternal instinct emerged loud and strong. On Monday, I took Dylan to an occupational therapist that specializes in sensory integration. She did a full physical evaluation and told me exactly what I anticipated she would say: Your son has sensory processing issues. I knew this at the deepest center of my core, yet hearing the words spill from her mouth made me feel ill. She validated what I suspected for a long time, but instead of feeling relieved, I felt angry. Angry at every person who ever brushed off my concerns, told me not to worry, or smiled and said, “In a few years you’ll look back at all of this and laugh.” I wanted to line these people up and punch them in their faces. And the anger I felt toward myself was even worse. Why hadn’t I done something sooner? I spent most of Monday curled up in a ball on the couch, crying, and watching “Grey’s Anatomy.” The aha moment came when I was done crying and feeling angry and I remembered the other thing the therapist said: We can fix this. Just like when I first took Dylan home from the hospital, I have to listen closely to the voice inside of me that knows what’s best for my child and act on it. Boldly. To start, I’m switching pediatricians. Our current doctor is one of the people who disregarded my concerns overand over again. On Monday afternoon, I did what any Loving, Guilty and Shopaholic Mama would do. I picked up the boys at school and took them to Toys R Us. (I had a $5 coupon.) It had been quite a day for Dylan. He didn’t understand everything that was happening – in fact, he described his evaluation with the therapist as “fun”– but he’s intuitive enough to know something was up. For that, he deserved a new toy. 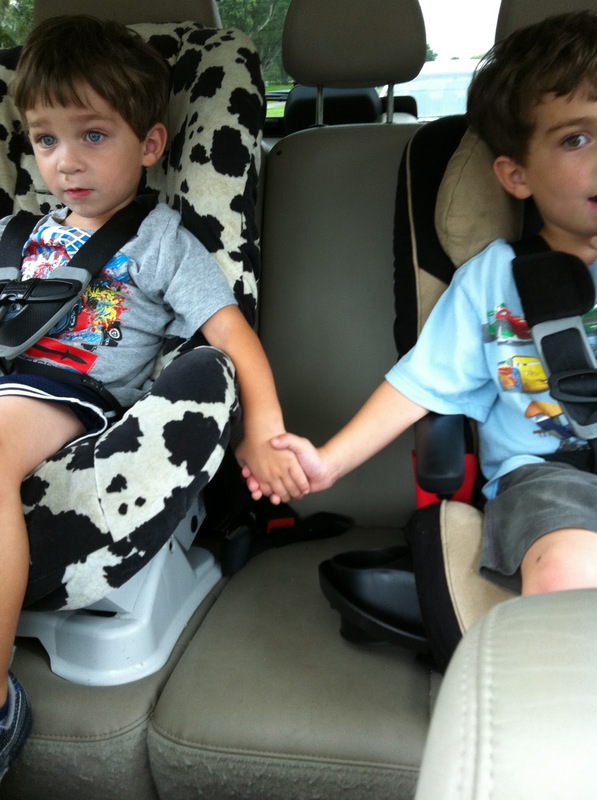 I snapped this picture of the boys holding hands during the short drive from school to the toy store (don’t worry, I took the picture in the parking lot, not while I was driving). And just like that, I had another aha moment. We were going to be okay.